The following report is an abridged version of "Toward an American Military Pastoral" to be presented at the Conference Echo Red: Military Archaeologies and Architectural Trajectories on 31 May. Military bases help to preserve landscapes from development and thereby produce valuable spaces of difference. Precisely how these spaces of difference are produced and then transferred is at the heart of the preservation concern at Echo Red. The most profound statement on the preservation of military bases came to me from a South Korean man who had served in the South Korean army and worked on a US army base in Seoul. While the South Korean government eagerly awaited the opportunity to redevelop this land once the US army would leave, his one wish was that it remained an “exotic” place. He recalled the feeling of walking along Itaewon Street at the base’s entrance, where it felt like a piece of America, or at least something like going to Hawaii in the middle of Seoul. For him what must be preserved is the military landscape’s particular ability to reproduce an exoticism within the familiar. It is the mechanism which maintains that tenuous balance that is in question when we ask how to preserve these landscapes. the tip of a spur, which ran out from the flank of a mountain and was linked to the main mass only by a narrow ridge. … (T)he dwellings of the lower classes, extending down the slopes of the hill, were within convenient distance both of the citadel above and of the field below. The hilltop fort creates a fearsome image of an impenetrable fortification because it is joined with the earth. The Romans… not depending so much upon nature as upon art and good discipline in their camps, constantly chose locations where they could arrange their forces in usual order and exert their whole strength when the need arose. Hence it came to pass that the form of their encampment was always the same because they never swerved from their established discipline, but selected a location which they could make conform to it; whereas the Greeks were often obliged to vary the form and manner of their encampments because they made their discipline give way to the location of the place, which could not always be the same or similar to it. Machiavelli goes on to demonstrate that a clear plain is the ideal site for a fortress-city where the desired geometry to exert flanking fire upon attackers is unimpeded by natural features of the terrain. The ‘site’ may be thus abstracted, as in a Roman outpost with its cardo and decumanus, as a second nature which produces the desired effects of fortification at a theoretically minimal contingency with its environment. In addition, armies may be readily deployed by the gridded order of the Roman outpost. 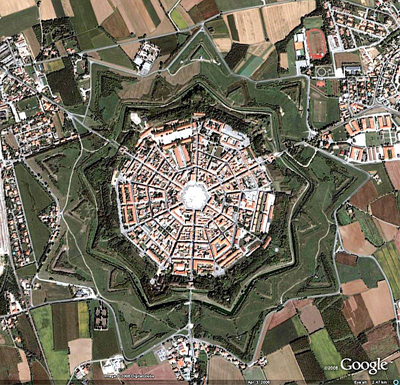 An example of a Roman-abstracted-site fortification is the radial fortress-city of Palmanova in northern Italy. The plan was conceived as a projection upon the landscape, a prototypical nine-pointed star, with little regard for what an ideal civilian space might need. The fortress was designed to repel attacks using the concept of ‘defense-in-depth’. A bastion could fall, but the defense mechanism of the walls permitted an amount of porosity and so made the breach physically impassable through the defenders’ flanking fire. The interior of the fortress served the defensive needs beyond it, and even became a new front line when the wall was breached. Yet the artifice is not limited to the city walls. Napoleon, upgrading Palmanova to defend against a new century’s advancements in artillery power, had three surrounding villages leveled in order to meet his engineer’s requirements. The expansive glacis meant that villagers would have to traverse long distances of a militarized landscape from the fields to the town center. This separation, and the familiar concept of razing a site in order to create a tabula rasa, foreshadowed the alienation of 20th century city planning from its natural surroundings. 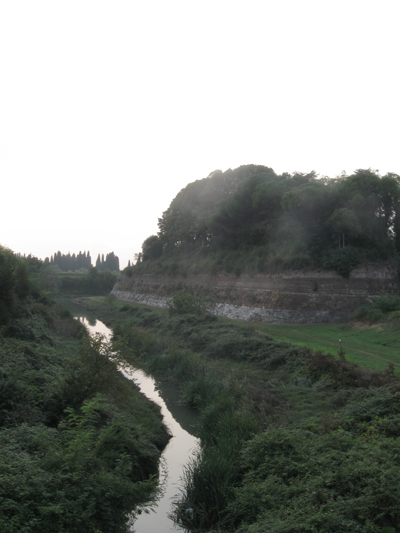 Palmanova is essentially a ‘Roman’ fortification, as it could be placed on any flat plain. It is worth noting as it parallels the history of the jet noise barrier that in the late 20th century the citizens of Palmanova became increasingly aware of the recreational resource of the glacis. Jogging trails, horse stables, and exercise parks sprung up along the perimeter. 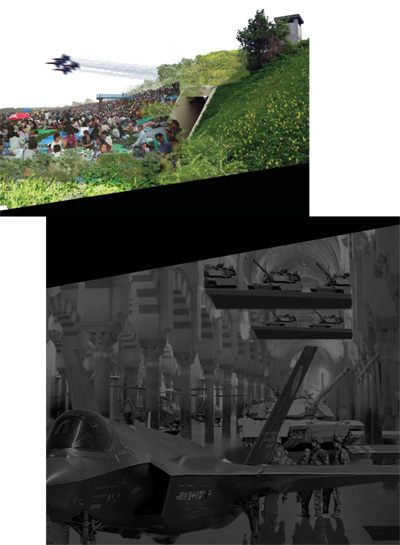 The reclamation of this military space transforms Palmanova from a purely artificial construction to something in between an artificial and natural construction. 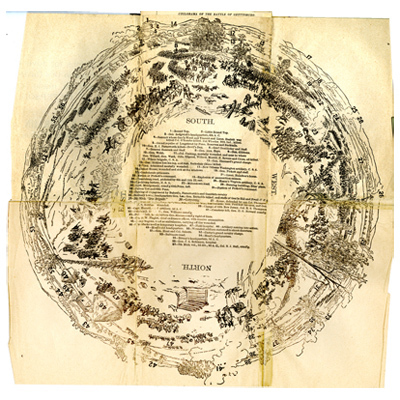 From a totalizing view [Fig 3-2], the plan of the radial city within the glacis reads as an anomaly in the landscape. However, from a localized view [Fig. 3-1] the forms of the bastions and dry moats lack a distinct resolution or separation from the natural landscape. They are sculpted moments in the landscape, never separate to begin with. Any example of military fortification may be placed within the spectrum defined at its ends by Greek and Roman fortification. We can use this rubric of how much the features of the site contributed to the fortification in order to make judgments about how to preserve these landscapes. The more that a fortification’s identity or historical value is associated with the landscape, the less action a preservationist should take in countering the forces of entropy. Thus it is critical to establish the system of values for determining how much of the military form is produced by natural means and how much by artificial means. Guam has always attracted military hobbyists on the tour of the Pacific to witness the history of America’s insatiable quest toward its Manifest Destiny. In WWII Guam was heroically recaptured by Marines of the Third Division from Japanese forces. These Marines would go on to fight in Okinawa and remain based there into the 21st century. While Guam was already a territory belonging to the United States, Okinawa was governed by the US for 25 years before being turned over to the Japanese in 1970. It is possible to link the military occupation of the Western Pacific with this 19th century notion of Manifest Destiny, whereby America has a right to occupy these territories in order to produce and maintain wholeness. It is a continental notion expanded to far-flung islands in the empire. Since the military was evicted from the island in the middle of this century, these military tourists are coming in much greater numbers. What is on view here on Guam is not a display of military power but the evidence of a bygone regime of power subsumed by the landscape. We witness here the ultimate power which governs a landscape. The force diametrically opposed to preservation is entropy. Therefore, the military tourists are in search of a picturesque landscape produced by entropy. I will call this picturesque the American military pastoral. How does this 'American military pastoral' exist in comparison to America's memorial landscapes? Let's consider Gettysburg, a seminal example of a memorialized landscape. It was an ordinary small town with no seeming strategic value prior to the summer of 1863. The convergence of the Union and Confederate armies transformed a ridge with a few promontories just west of the town into a storied landscape, though without the memorials there would be nothing to remind the visitor of a great battle. Proponents seeking to glorify Gettysburg demanded the memorialization of the landscape in the decades following the conclusion of the war. These memorials, in all shapes and sizes depending on the state and decade of erection, define both the military strategic imprint and the touristic idyll of a ‘glorious’ battle. Tourists move in a parade along the front lines, pausing to reflect on what is portrayed, whether it is glory or sacrifice or both. Fences are restored to 1860s conditions. The forest is coppiced to maintain a density which historians believe is most accurate to the battle conditions. It is arguably over-memorialized and groomed as one would manicure a model train set. The landscape is mythified. The cyclorama of the Battle of Gettysburg also builds upon the myth of Gettysburg, yet it more closely achieves this notion of a 'military pastoral' than the battlefield itself. A 360-degree painting by Philippe Philippoteaux, of which four copies were made and exhibited across the United States and in Europe, the Cyclorama depicts a commanding view of the battle from a single position [see Fig. 3-5]. It is exhibited in a room fit to its form with a light and sound show, defines the pastoral landscape as a totality, where event and scene form a seamless and inseparable union. Exhibited in locations such as Boston, Chicago, and Paris, the Battle of Gettysburg was a spectacle of simulation. To appreciate the battle——to memorialize it——we needed to feel as though we were there, that the event has value in its reproduction. In its reproduction and transposition, the landscape becomes exotic. We cannot separate a definition of the American landscape from the wars we have fought at home and abroad. This is especially true of the militarized deserts and mountain ranges of the American West, in places where only localized battles between Americans and Mexicans or white settlers and Native Americans have taken place. Since those localized militarizations of space, these wide expanses of terrain have been vital in training, weapons testing, climate simulation, and urban warfare simulation for the wars of the 20th and 21st centuries. America has depended upon these landscapes in order to conduct warfare across the globe, thereby linking the American pastoral with landscapes beyond America’s borders. Military tourism belongs to this practice of searching for the American pastoral, distributed on a global scale. We are also military tourists at Gettysburg, fascinated with our own ruination. The landscape preservationist cannot be the military tourist. I do not seek to memorialize deserts scarred by atomic testing nor these landscapes such as the jet noise barrier on Guam which symbolizes an unjust transmission of power. To memorialize a landscape one must manufacture its myth. Leave that to those are best at it, the Cyclorama painters of today: Hollywood producers, of course. However, these landscapes of war and of power are worth preservation. We enjoy them not only because they mark a passage of power or the residue of an empire . These landscapes continue to produce exotic places within a sea of normative space. We can witness here the dissolution of power, as all that is solid melts into air. In order to hold on to this landscape of difference, to prop up a modicum of residual military power, the preservationist then has the delicate task of curating entropy, of manufacturing the picturesque. So I am surveying the jet noise barrier, with support from the National Park Service and in accordance with values set out by the NHPA, searching for those moments where the 'Roman-ness' of the fossilized noise-barrier section can still be identified. It may be preferable, at other moments, to allow the structure to appear more 'Greek', as an augmented landscape. The American Military Pastoral is, in its most glorious and its most farcical, a blend of Greek and Roman; it is another vestige of imperial woe. I enjoyed reading the blog about the various military outposts of the past and present, particularly the past. For the present ones, not only those of the US but also of the former USSR and former East Germany, to retrieve two relics of the past, environmental deterioration is a real threat. I was also interested in the Korean fellow's thought about preserving or creating something exotic. His thought didn't go where I thought it would, but it evoked some thoughts I have had about military bases at which I have taught over the years, mostly in Germany, Italy, Belgium and Greece, but also since 2008, in Okinawa. Here, the tiny island is replete with many US bases, covering about 20 percent of the land where 1.5 million Okinawans also live. The bases are hideous and need to be removed; one observation, though, I would like to share. These bases are sprawling, particularly Kadena Air Base, Futenma Air Base and Kinser Marine Facility. Over the years, Okinawan communities have grown around the bases. The manner of development seems ad hoc and proper planning must have been influenced by the presence of these large installations, around which traffic had to be diverted. My first impression of Japan was Sapporo, a new, grid-planned city, very modern, clean, efficient. I was shocked when I arrived in Okinawa; it is quite the opposite here. Poor zoning and no observable plan seems in place. Instead, one sees hundreds of jumbled incursions into the landscape, with little to no regard for the world famous Japanese emphasis on beauty, harmony, living within nature. The military bases are no doubt environmental super-sites of tomorrow, but they occupy some of the best land on the island and are mostly empty, with underground wiring, the complete opposite of the knotty tangles of decades of add-ons and ad hoc building. My point is this: one good thing about the US reticent to hand over the land and find somewhere else to park their aircraft and training equipment is that they have inadvertently saved the land from the kind of nutty zoning or planning I have seen elsewhere on the island. Thank you for your thoughts Christopher. I spent about 12 days on Okinawa last year I, too, was bewildered by the way the island was developed. It seemed an odd collage of island villages, Japanese suburban sprawl, and American "inspired" development (i.e. A&W Root Beer drive-thru's from the 1950s still popular on the island). I found the fence edge to be the only way to navigate the island, and even then the military base came into odd conflicts with the surroundings.